The mighty king of New York’s Central Park Zoo, Alex, is a little out of color today. 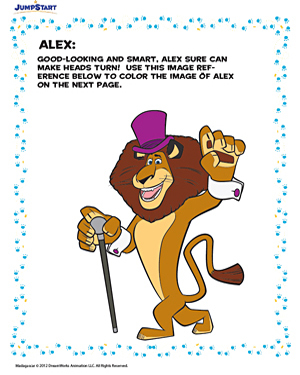 Give him his charisma back by filling this fun coloring page with his characteristic colors. Go ahead, bring back the color in Alex’s life! You should also check out the Color Alex - 2 and Color Alex – 3 pages!